Last week in our CSA box we got some Romanesca cauliflower. 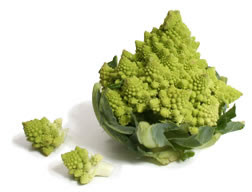 Having no idea what to do with this odd-looking vegetable I browsed through one of my cookbooks and found a recipe that looked...interesting. Interesting enough to be worth a try. FYI, this recipe was taken from Organic Kitchen, a cookbook from my dear friend Heatherly who, incidentally, is getting married this weekend--congrats! It was delicious. And easy, to boot! That's always a good thing for a side dish. So here is the recipe, if you care to liven up your boring old steamed carrots and broccoli (and Romanesca cauliflower). 2. While the veggies are cooking, mix together the lemon rind (or juice), garlic, seasoning and breadcrumbs. 4. Sprinkle the lemon/garlic mix over the veggies and stir to coat them with yumminess. 5. Finely chop the hardboiled eggs and sprinkle on top. 6. Serve it all nice and warm. I pretty much ate this for dinner last night. By itself. Note: After this Morning Cup my mom suggested I start a blog just for cooking, recipes and wine and beer reviews...so I did! Its called The Giggling Gourmet and while its still in its beginning stages there's a few good things to check out! Thanks for sharing! This sounds absolutely delicious! Yum! !